South Africa coach Peter de Villiers has played down reports that his side are on a quest to make history in this year's Tri-Nations. The undefeated Springboks take on Australia in Brisbane on Saturday knowing victory will not only bring them the Tri-Nations title but also take them a step closer an unprecedented clean sweep. New Zealand have won three Tri-Nations trophies without dropping a game, while the Springboks did the same in 1998 - however there were only four matches in each of those series. Speaking ahead of the Suncorp Stadium showdown with the Wallabies, De Villiers looked to pour cold water on the suggestion his side could achieve the feat. "We don't have control over winning and losing, we have prepared the same as we have for all the games up to now," he said. "We know where we can be, we know where we want to be, but we're not taking anything for granted. It will be brilliant if we can win this next game." The Springboks boss believes his side cannot afford to get ahead of itself and insists looking beyond their latest clash would be a mistake. "We look at every game and treat it as the last game of our careers, we throw everything into that game and we go from there," he said. "We're not chasing records, we're looking after the small things first and at the end if we're successful, that kind of stuff will come." 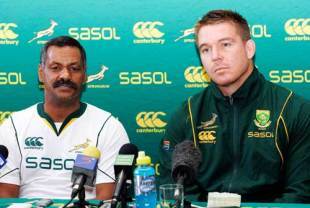 Springboks captain John Smit was quick to echo the caution of his coach. "We need to adopt an attitude like that ... there are five points available for us and that's what we're after, we have to take it one game at a time. At this stage, the only focus is to win on Saturday by any means possible." The Springboks have once again been able to keep a stable line-up, with the exception of Odwa Ndungane who will replace JP Pietersen on the wing. The Boks are also confident Bakkies Botha (knee) will be fit for the game. "We rested Bakkies again today, we're going to give him until Thursday," De Villiers said. "But he should be cleared. The doctors said he will be able to run on, so that's why he is there."